For years and years, I had called Italian food my favorite type of cuisine from my first taste of spaghetti and meatballs in elementary school to my gradual move to eating at Italian restaurants in high school to my initial cooking forays into Italian dishes in college. Prior to discovering the intricacies of other cuisines, I stuck firmly to the flavor profiles of Italy and even studied abroad in Rome just to immerse myself in the culture and indulge in the societal upbringing of "slow food." Though I now cannot name one specific favorite cuisine, I can still say that Italian flavors are high on my list of preferences. This pasta dish was unique because we took advantage of our own recent focus on local and homegrown. The basil came from Duc's indoor hydroponic set-up, the tomatoes from a nearby farmers' market, the rainbow peppercorns from Melissa's Produce, and the Hot Italian sausage from the fantastic Zeigler's Sausages who cooks out of The Hood Kitchen. What a combination. 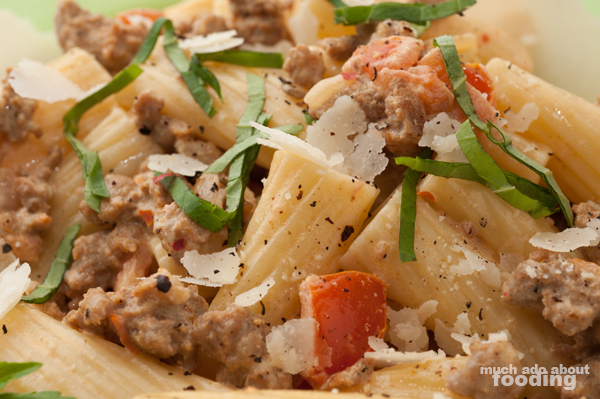 It's fresh, inviting, and just a feel-good dish. 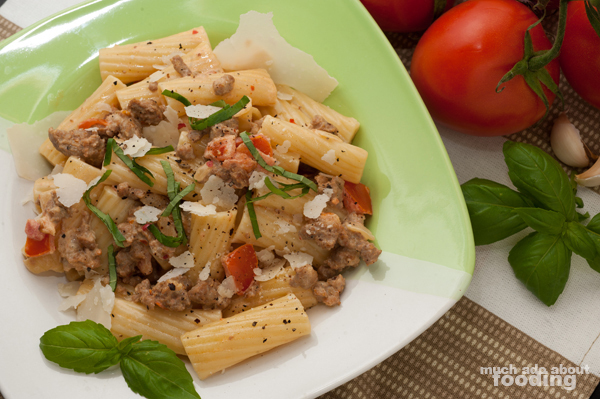 Whether you are using dry or fresh pasta, cook it as directed. You can let the water boil while you work on the other ingredients. Also, set out heavy cream to come closer to room temperature. In a large non-stick skillet, add olive oil to barely cover the bottom on high; once shimmering, add chopped white onion. Stir until barely translucent. 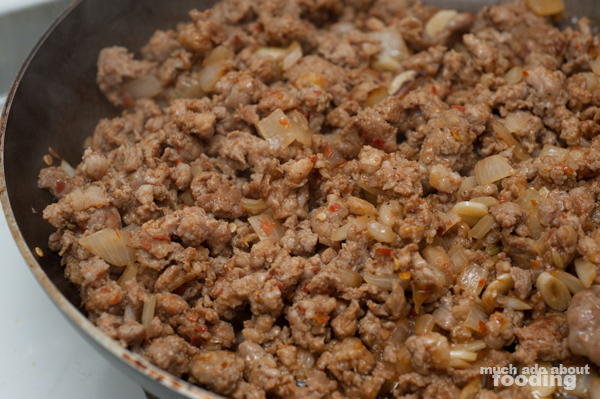 Remove sausage from casing and add to the skillet. Break up with wooden spoon; I use this instead of pre-ground sausage to ensure that it hasn't been exposed to the elements nor cut in with other meat. Then add garlic and once the sausage is browned, tomatoes. 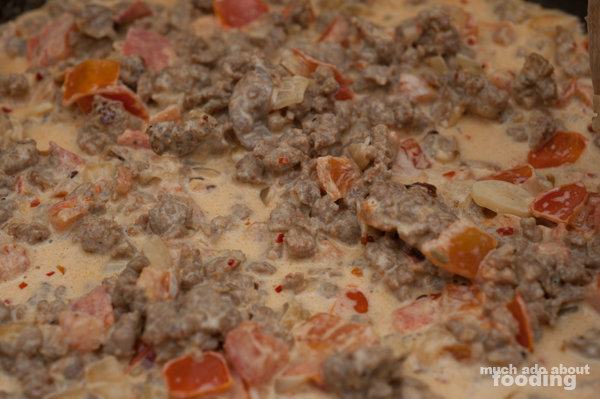 The cream sauce will derive its flavors from the mash of ingredients in the skillet so here is why using the right sausage is important. 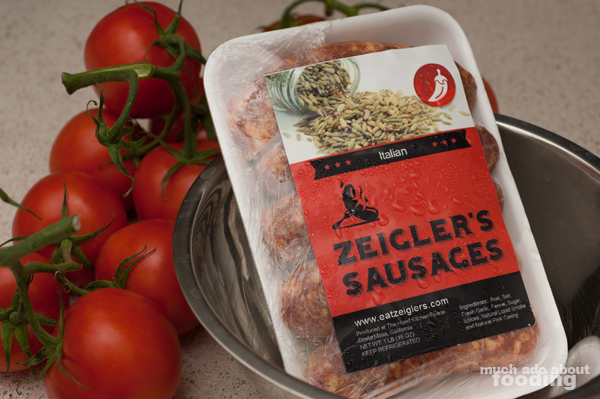 I used Zeigler's Sausages because it has been seasoned the way I like it, not too salty and not too spicy. Reduce the heat to medium before slowly adding in heavy cream, stirring the whole time. 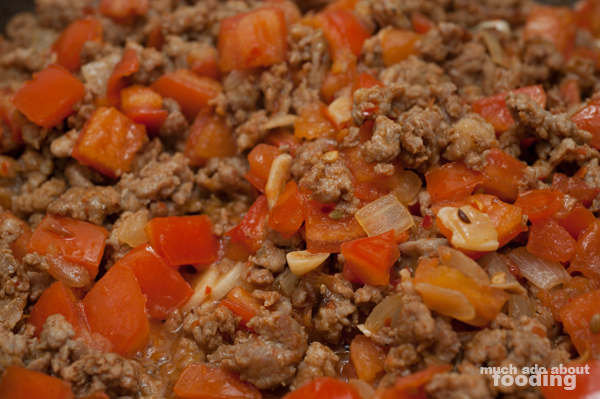 Cook for 2-3 minutes, constantly stirring to prevent clumping. 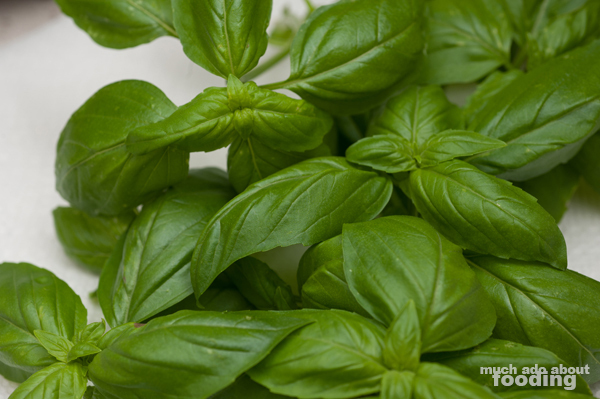 To slice basil into ribbons, stack leaves atop each other and roll before slicing. 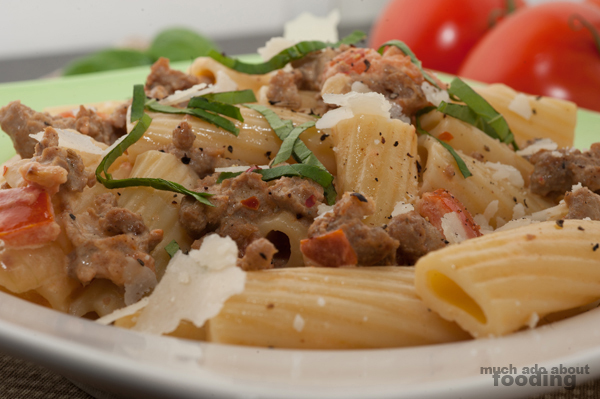 Toss pasta with sausage cream sauce before plating. 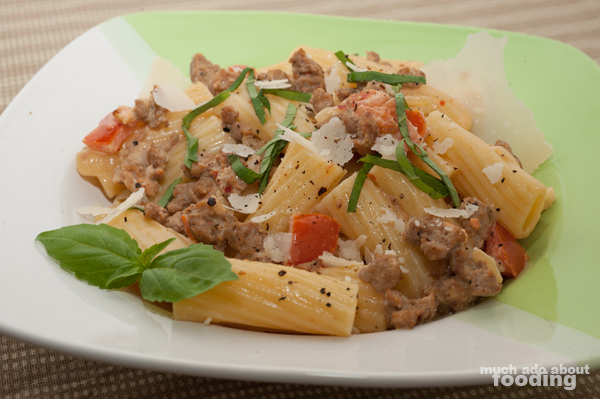 Garnish with basil and desired amounts of shaved Parmigiano-Reggiano and ground rainbow peppercorns. Enjoy!